Sied yr Ardd is a detached, cabin-style cottage next to the owner's home on the outskirts of the village of Ystradgynlais. The cottage sleeps two adults in one double bedroom and there is also a shower room, an open plan living area with a kitchenette, dining area and sitting area. 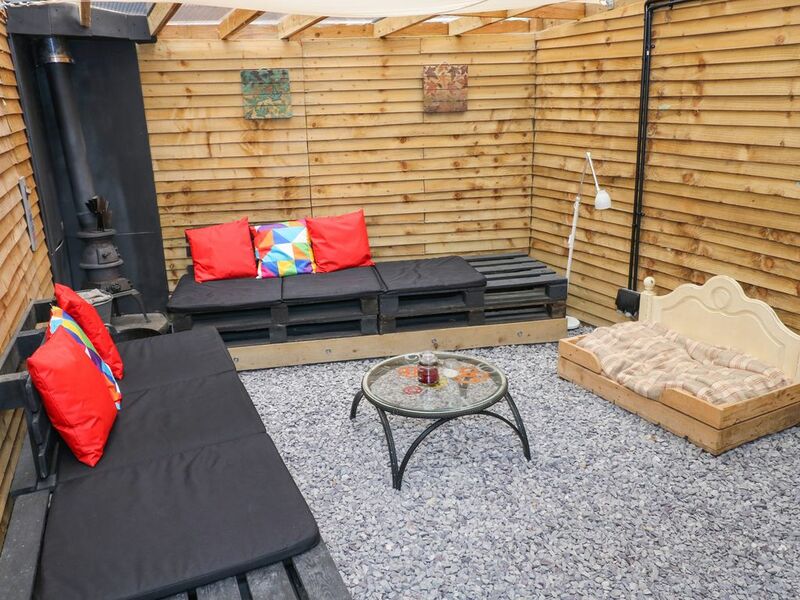 There is a garden room with a woodburner attached. Outside there is off road parking for one car with additional roadside parking available and a patio with furniture. Sied yr Ardd is an ideal base for couples looking to get away from the hustle and bustle and discover the splendour of South Wales. Amenities: Electric panel heaters with woodburner. Combination oven/microwave, 2-ring electric hob, fridge/freezer, TV with Freeview, DVD, Bluetooth CD/radio, WiFi. Fuel, power and starter pack for stove inc. in rent. Bed linen and towels inc. in rent. Off road parking for 1 car with roadside parking outside the property. Bike storage. Private gravelled patio with furniture and BBQ. Two well-behaved dogs welcome. Sorry, no smoking. Shop and pub 1 mile. Note: Four steps to access the property and four steps down to garden room. Town: Ystradgynlais is a former mining and industrial town in the Tawe Valley on the edge of the formidable Brecon Beacons National Park. The area is peppered with strong valley communities that benefit from the fabulous location and being easily accessible, with the mountains rising into the extensive Brecon Beacons and a myriad of outdoor activities, perfect countryside for walking and cycling with routes stretching away in all directions. One double bedroom with a king Size bed and a brown leather recliner sofa. Shower room with shower, basin and WC. Open plan living area with kitchenette, dining area and sitting area. Garden room with woodburner. Electric panel heaters with woodburner. Combination oven/microwave, 2-ring electric hob, fridge/freezer, TV with Freeview, DVD, Bluetooth CD/radio, WiFi. Fuel, power and starter pack for stove inc. in rent. Bed linen and towels inc. in rent. Off road parking for 1 car with roadside parking outside the property. Bike storage. Private gravelled patio with furniture and BBQ. Two well-behaved dogs welcome. Sorry, no smoking. Shop and pub 1 mile. Note: Four steps to access the property and four steps down to garden room.